With a College sophomore, a junior in high school and working at a University, I am knee-deep in College hunting and surrounded by high school and College age students. I’ve often said that I have LOVED every single phase of my children’s lives, but this phase offers particular joys and learning opportunities. 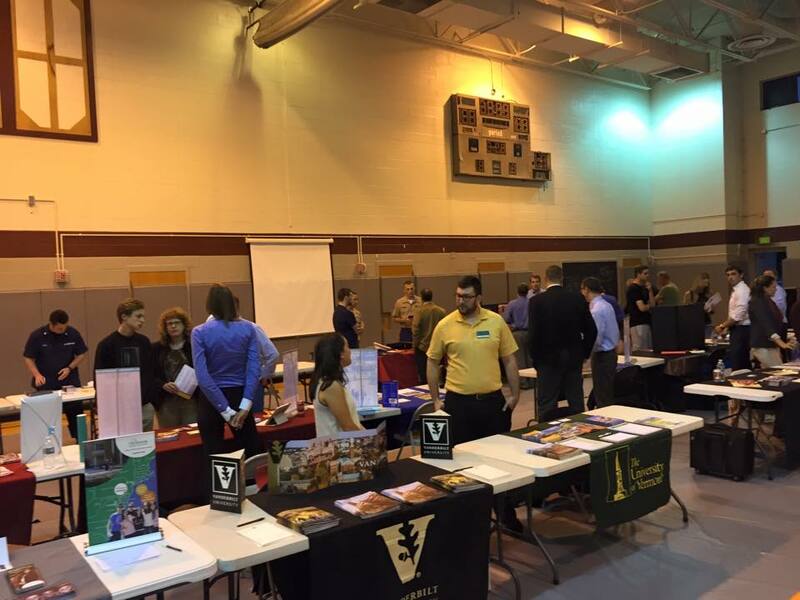 Working at a College Fair afforded me a unique window on this chapter of life from the perspective of students and parents I didn’t know. 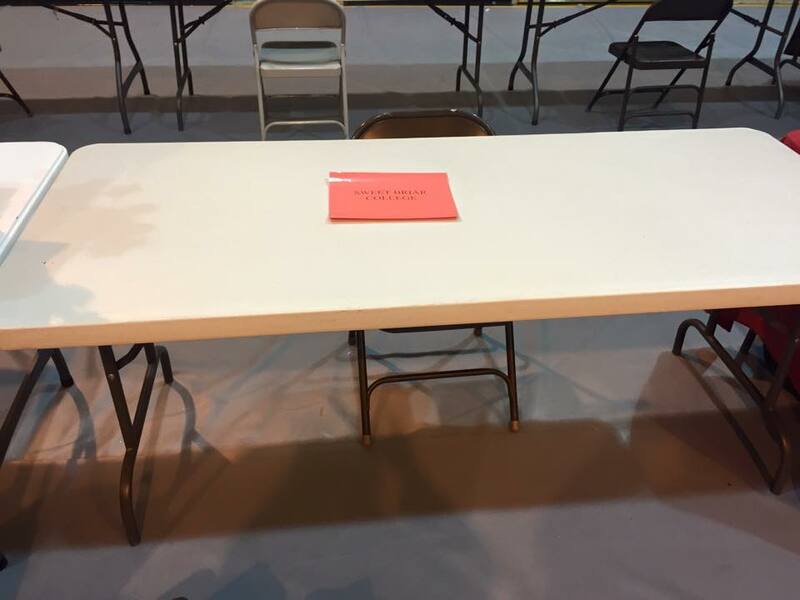 Blank Slate: Arriving at the College Fair. 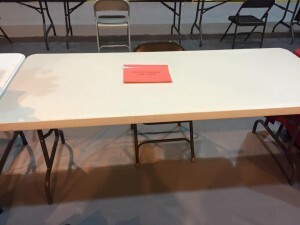 A large (un-airconditioned) gym, a plastic folding table, two metal folding chairs and the name of the College: this is the blank slate Colleges start with when engaging with potential students. All are equal until the representatives and materials arrive. This blank slate is also felt by students who are considering where they will attend College. If you ask the question to many teenagers, “Where do you want to go to College?” The answer you will usually hear is, “Dunno”. It is hardly surprising they respond this way. The sheer number of choices can be overwhelming. Relationships forged for a lifetime. Foundation for graduate school or career. Not all colleges or universities offer the same experience (hardly!) or the quality of interaction post graduation. Discernment through questions, college fairs, meeting representatives and campus visits is essential. It is too bad that more time in high school cannot be devoted to the process. Fortunately, my two sons were part of a program that exposed them to College searching in Middle School. They visited area colleges touring through academic halls, dorms, athletic fields, auditoriums and (their favorite) dining halls. They had mock College Fairs where they designed science-fair like displays about a College and they acted as admissions officers for their younger classes. When the mock college fair came about, I recall that my younger son picked Cornell University (which he has visited as we have family who live nearby) and my older son picked the University of Maryland (where I work and where he has attended many games as season ticket holder). Do you like smaller or larger classes? Would you like to be in a warm or cold climate? Do you want to experience all four seasons? What might you want to do after graduation? Are there college programs for that? P.S. It is TOTALLY OKAY if you don’t know — that’s also what College is for. Working at a college fair made me realize what a benefit they had been afforded being exposed to these questions so early in their lives. Exposing children early to choices after high school gives them something to compare and contrast. Student volunteers greeted College representatives and escorted them to their tables. I noted all of the students with whom I interacted came and visited. Standing behind the table at a College Fair is kind of like cold calling, only even less personal. Many of the students passing by have their gaze towards the floor and hurry past. It almost felt as if some of them felt that by inquiring, they were somehow intruding. I am sure the room felt overwhelming to them. 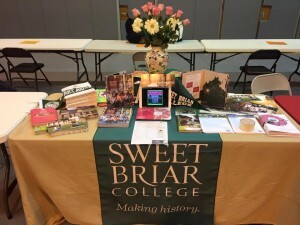 Our table featured brochures with smiling faces, pink and green (school colors), and program fliers on study abroad, equestrian programs and a list of majors. Most students engaging with us were unsure of their major. What surprised me is how guilty they seemed to feel about this. So many of the (large) schools to which they were applying required them to select their major coming in — even having to apply to competitive majors alongside their general admissions. I am familiar with this dilemma as I work at the University of Maryland. It disturbs me – this trend to specialize so young. Most high schools with strong academic programs scarcely have the time for students to explore potential fields of interest. My sons were tracked into advanced math and AP programs squeezing out any chance for most “elective” courses. Most of their friends were on the same path. How any of these students can feel they have found their major/passion/purpose when their course selection has been prescribed and required baffles me. Most smaller liberal arts colleges don’t even allow a student to “declare” a major until their junior year. Their first two years expose them to required and elective courses offering a vast array of options. Perhaps my sons hearing me encourage them to EXPLORE versus SPECIALIZE led my older son to select an independent, liberal arts college instead of the University of Maryland (where I have tuition benefits). I was actually quite pleased. I suspect his brother will follow in his footsteps. Our table featured fliers on programs, brochures with smiling faces and (our secret weapon it turned out) FLOWERS. How students add to and eliminate colleges on their list is somewhat of a mysterious process. It is often influenced by family connections, their friends and perhaps an individual who turned a college into a smiling and welcoming face. That was certainly true for me when I chose Sweet Briar College. It was also true for my son when the admissions officers reached out to him from Principia College. I want to attend a big University. I want to attend a college where its warm. College fairs are a sea of tables each with similar smiling faces – yet each offers a unique experience. My fellow alumna, Sara Rothamel, and I began engaging students. We made eye contact, said hellos and began to engage. The tables around us were manned by professional admissions officers, a few parents and some alumni (like us) were sprinkled among the tables as well. 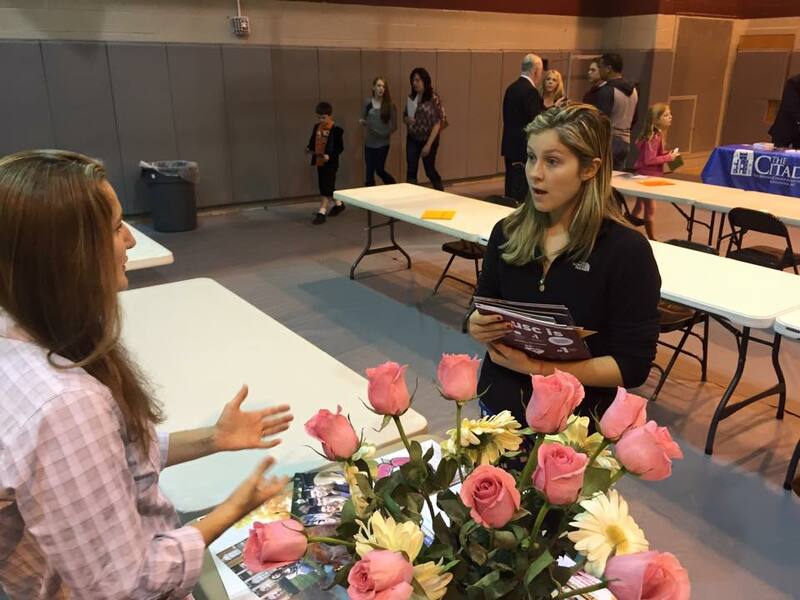 My first observation is that the parents and alumni manning tables were much more conversational with prospective students. The tables around us with just one person were much quieter throughout the evening and seemed to have less interaction. Have you thought about College in Virginia? Have you considered a woman’s College? We were aided by many people coming giving us high fives and fist pumps to congratulate us on Sweet Briar being saved. As we chatted, the energy and interest attracted other students and their parents. At some points, we were two-people deep! Every college table had pictures of smiling faces, bucolic campus scenes, animated professors, athletes engaged in sports, etc. We needed something to set us apart. I was intrigued by the questions… and the lack thereof. I’ll tell you this — we are going to have a whole lot better crime solving in the years to come (or a bunch more prosecuted criminals). There are a lot of CSI-watching teenagers who are dead-set on becoming the next Abby Sciuto. I will hand it to these students, they knew exactly what they wanted in their next college: Make me a famous CSI (crime scene investigator). While we tried to sell the benefits of a strong science curriculum, not having an actual major led these students to gather a few pink and green brochures, but then turn on their heel. Have you ever considered a women’s college? We asked this question as an opener. Our pink and green and flowers seemed to send the right message to filter out the wayward young man who ventured over. I was happy to speak to them since I have sons. I steered a few towards our brother college, Hampden Sidney; my father’s college, the Citadel; and liberal arts colleges in general. Superior academics; knowing your professors. 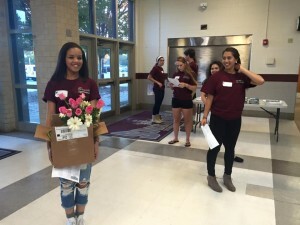 Great social life – on campus and in the region. We had a number of very interested students who lingered for nearly a half-hour. We hope these students convert to enrollments! As the fair continued to unfold, our numbers increased. Equestrians with a love of horses and knowledge of our national riding program came by with sincere interest. Girls with an interest in the sciences and technology were impressed by our having one of only two accredited engineering programs in the country. Tell me about your board of directors and the college leadership. What is the network for students like AFTER graduation? How do you help students secure work and what is your rate of placing students in jobs? What opportunities are there for parents to participate in the life of their student? Will I be able to make friends? Can I create my own major? I was surprised by the few questions we had about cost. Throughout the evening, we had two questions about tuition and financial aid. It could be that the high school is in a rather affluent area and that students are blessed with parents who have budgeted their college. Those who did inquire were not phased by the price tag, particularly as we explained that financial aid decisions were made independent of admission. 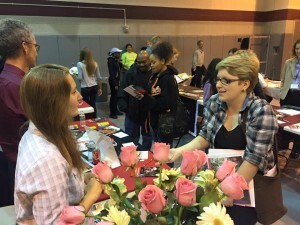 While our fellow colleges packed up at the stroke of 8:30, we lingered until after 9pm speaking to interested students. In characteristic Sweet Briar fashion, we lingered well past “closing time”. At a place where learning is 24/7, where you know your professors and you take great pride in your education, a 9 to 5 culture just doesn’t exist. All around us our fellow college counselors folded their chairs, packed up their brochures and snapped their cases closed at the stroke of 8:30pm when the fair was to end. However, there were students still circulating throughout the fair. As a steady stream of admissions officers filed out, Sara and I continued to greet students and hear about their hopes and dreams. One of our most earnest candidates came towards the very end. 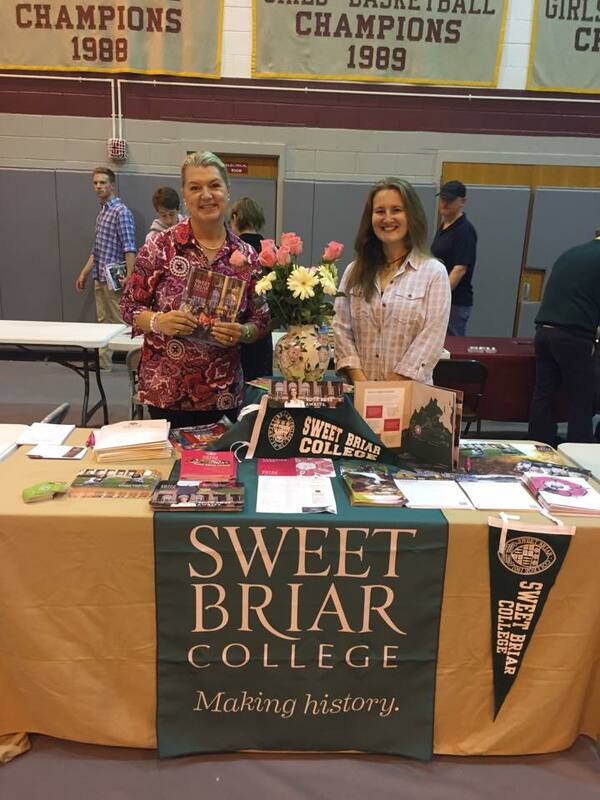 Alumnae at work: Sara Rothamel and me at the Broadneck College Fair. As I held the fan of interest cards in my hand, I thought about each precious prospective student who had interacted with us. 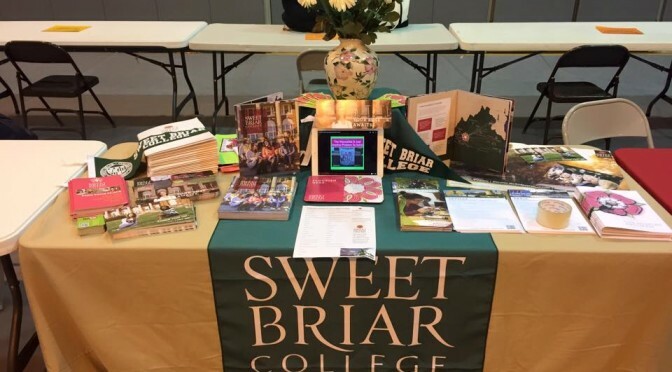 I remembered what had set Sweet Briar apart for me when I looked at Colleges – a personal touch. Sara and I agreed we would contact a few of the students who seemed particularly interested. I decided I would get some Sweet Briar postcards to send to the students with a personal note of encouragement (not just to apply, but also that they find a place where they feel at home). Having moved during my middle school and high school years, I yearned for a place I could call home. Sweet Briar’s friendly admissions officers, gatherings in my town, and my overnight visit made me feel welcomed. I couldn’t imagine attending anyplace else. My sincere hope for every student and their family is that they find a place they can call home. It is a privilege to attend College. There are so many options today. Being part of a residential community is a particular gift as so much growth happens outside of the classroom and on a campus where you and your mind can roam, explore and grow. Regardless of how many job changes, moves or relationship changes one may have in their life, their college can offer a consistent place to call home. Its alumnae/alumni network may also serve as a network for their entire career. Which is, of course, why I have worked so earnestly to save the College I love over the past months (but, thankfully, this isn’t a post about that). Having worked at my local community college (voted the top college in the country! ), I know that that sense of home is also possible even if a student is still living at home. There are exceptional community colleges around the country with caring faculty, staff and amazing opportunities for students to grow and explore career options. Still, having worked for one of the best community colleges in the country, the flagship University of Maryland and knowing many colleges and universities around the country, nothing compares to the benefits of an independent liberal arts college and a woman’s college. 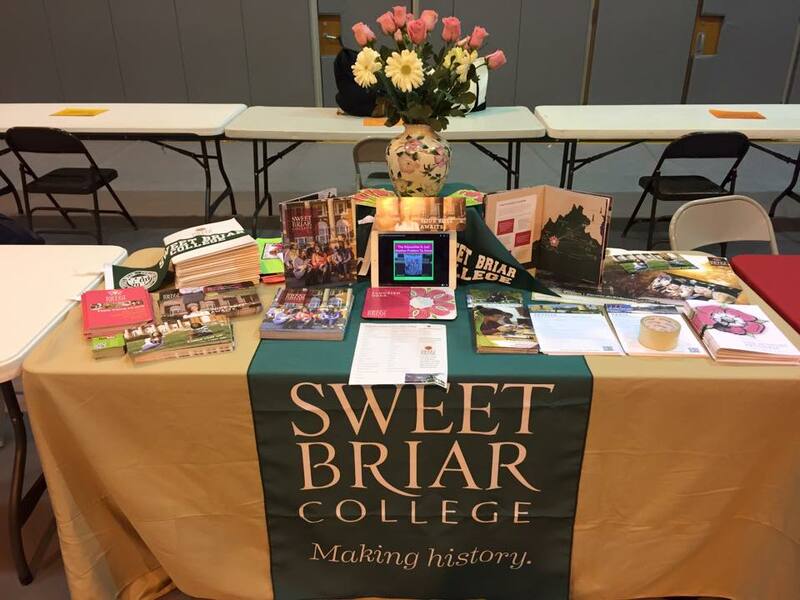 An independent liberal arts college like Sweet Briar offers an exceptional education — and a community — not just for four years, but for a lifetime. Consider working at a college fair. You’ll fall in love with your college all over again.